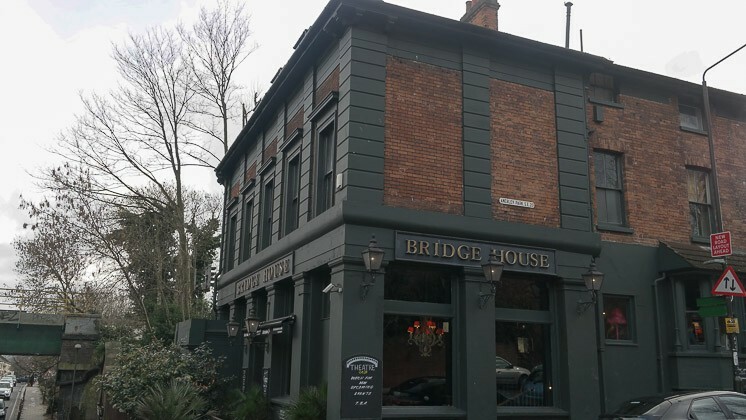 I was looking for a Sunday lunch close to home, and decided on Bridge House in Penge, which is next to the station. We parked outside on the single yellow line and entered through the double doors. A very impressive interior, tables on the ground floor and then some stairs up to the bar and other tables. There is also a theatre at the top, with comedy nights once a month. 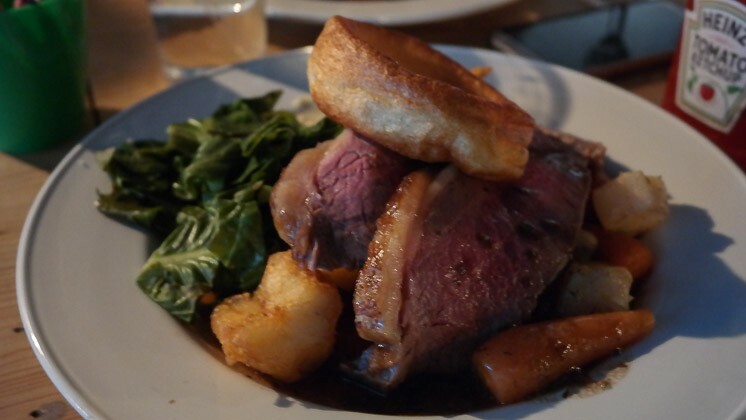 We were shown to our table in perhaps the darkest part possible – dark walls, wooden floors and lamps dotted around – it was nice and atmospheric, but not really suitable for Sunday lunch, I like to look at what I am eating! We ordered a mini bottle of processco for Claire (they only came in 200ml – £9.95 each), and Hoegaarden on tap for me. We skipped starters and went straight for the main event. I had checked on the phone to make sure JW, our wheat/gluten/dairy free toddler was able to have a Sunday lunch and was told all was ok with this. We ordered him and me a roast beef each, Claire asked for the roast lamb. The waiter then went to check to make sure JW could have the roast – and came back to tell us everything was cooked in butter! 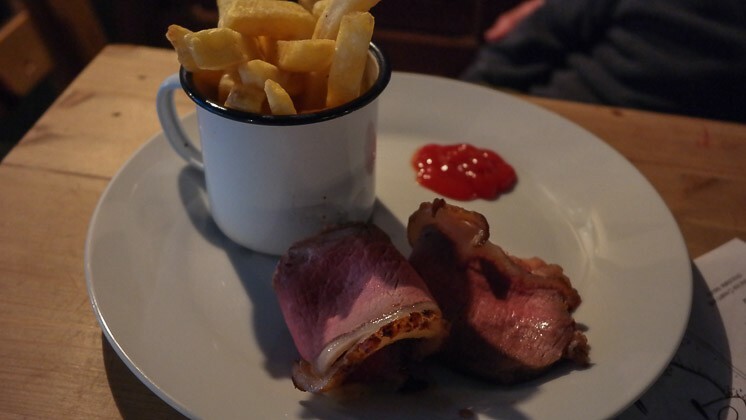 A thoroughly disappointing turn of events, we ordered beef and chips (the chips would be cooked in the same fryer as the buttered things, we decided to risk it this once). Lunch was served quickly – excuse the photo quality, the lights were extremely low. Two large slices of beef, green, 3 roast potatoes, carrots and gravy. The beef was cooked medium (I think it was pink, but difficult to see in the light). The potatoes were not crispy, but were seasoned very well with pepper etc. The greens were good as were the carrots. The Yorkshire pudding was flat, but enjoyable. The meal itself was nicely seasoned, I liked the large horseradish serving – lastly, the gravy was thick and flavoursome. The waiter checked to see if they could do anything for JW – we decided not to have anything as he came back with a “no”. When we were being seated, the waiter brought along 3 different colouring papers for JW, along with crayons. I don’t believe they had changing facilities, but were able to provide a children’s menu. Overall, ok for families. A mixed bag, this one. Claire’s and my roast was ok- although there was a bit too much fat for her liking with the rolled lamb shoulder. The staff were friendly towards JW and it was good they had some colouring and crayons. It was really dark where we were sitting, which spoilt the lunch a bit for us. 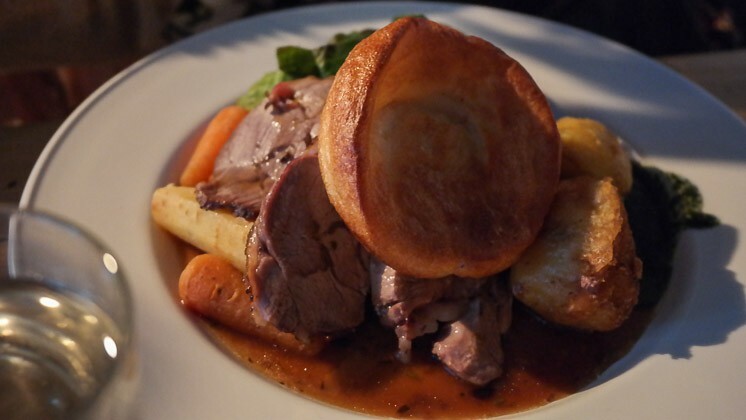 Really though, I should have been told the truth on the phone with regards how the roast was cooked – I was completely up front about dietary requirements. Also, we were charged for a full Sunday lunch, even though he only had beef and chips. So, avoid if you had dietary requirements, for all others, The Bridge would be an ok Sunday lunch.